The Mole is widespread in mainland Britain (but doesn’t occur in Ireland). They are present in most habitats where the soil is deep enough to allow tunneling, but are uncommon in coniferous forests, on moorlands and in sand dunes, probably because their main prey of earthworms are scarce in these areas. We are all aware of this small mammal but few of us have probably actually seen one, although we have all seen their efforts in the form of mounds of soil on our lawns. 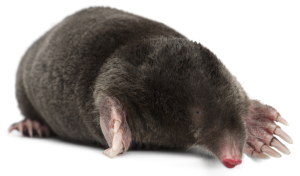 Moles are between 12-15cm in length, with short black fur, a pink fleshy snout, and spade-like forelimbs. They really are unmistakable, but actually seeing one alive is quite unlikely. Both males and females are solitary for most of the year, occupying exclusive territories. With the start of the breeding season, males enlarge their territories and tunnel over large areas in search of females. A litter of 3 or 4 naked babies is born in the spring. Fur starts to grow at 14 days, eyes open at 22 days and they are weaned at 4-5 weeks. The young start to leave the nest at 33 days and disperse from their mother’s range at 5-6 weeks. Dispersal takes place above ground and is a time of great danger, they are sexually mature by the spring following their birth and can live up to six years although most don’t live beyond 3 years. Moles spend almost all their lives underground in a system of permanent and semi-permanent tunnels searching for food. The earthworm is the most important component of the mole’s diet, an 80g mole needs 50g of earthworms per day, although they also eat many insect larvae, particularly in the summer when available. Moles will sometimes collect earthworms and store them alive in special chambers, the stored worms are immobilised by a bite to the head segment. Food is either actively dug out of the soil by the mole or more often collected from the floor of the tunnel. Moles rarely forage on the surface, though if they do it is most often in times of drought and is most hazardous. Their main predators are owls, buzzards, stoats, cats and dogs, but vehicles and of course humans can also kill them. Moles have no legal protection in the UK and are regarded as a pest mainly due to the damage they cause to garden lawns and golf courses. However, It must be said though that moles can be beneficial to us, as they prey on many harmful insect larvae such as cockchafers (maybugs) and carrot fly, while their tunnels help drain and aerate heavy soils.